If you have a hard time getting up, even if you have set an alarm or use an extra loud alarm clock, then you are probably looking for the next big thing that forces you to wake up and stay that way. Most alarm clocks and applications offer convenient features such as a snooze button or a button to turn off the alarm with a single tap. While that is convenient, there is always danger that you use them and fall asleep again afterwards. 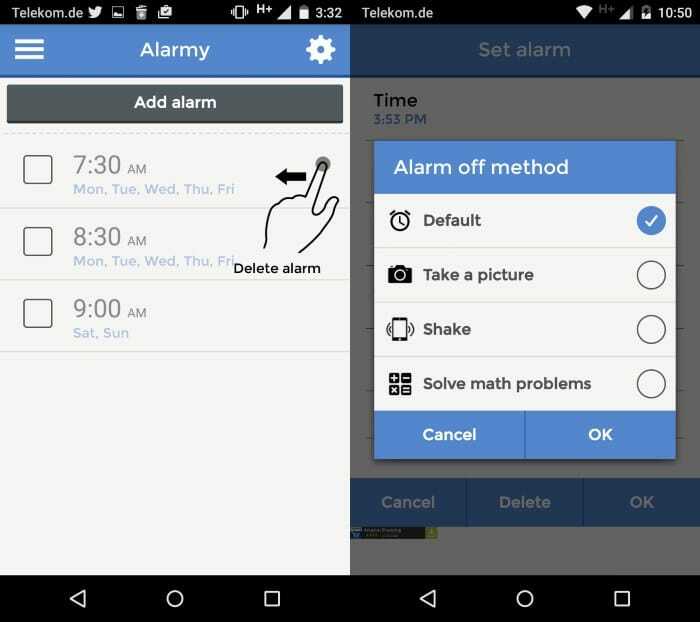 Some alarm applications make the turn-off process harder, for instance by forcing you to solve mathematical equations before you can turn off the alarm.This seems to work well but is nothing compared to what Alarmy for Android offers. At its core, it asks you to take a photo using the camera of the phone. That photo cannot be just any snapshot however as you have to take a snapshot of a location in your house (garden or front, or even somewhere else) that you have selected previously. This means that the alarm continues until you get up, move to the location you need to take a photo of and take that photo. Since you need to get up, chance is quite good that you will remain up once you took the photo. Of course, this works only if you select a location that is not close enough to your bed to take the snapshot right from it. What seems to work well is the bathroom sink, the fridge, and any other object in another room or outside of the apartment or house. Alarmy supports multiple methods of turning off the alarm including the regular way of turning it off with a tap on the button. Apart from taking a picture, you may also configure specific alarms to be turned off by shaking the phone or solving math problems. The program displays all existing alarms after a couple of tutorial screens. You may tap on any of them to configure them, for instance by selecting different ringtones or the alarm off method that you want them to use. If you select picture there, you are asked to take a picture which the app compares then to photos that you take in the morning to turn the alarm off. If they match to a degree at least, the alarm is turned off. The app is not for everyone obviously. While it works well if you have a hard time waking up but do wake up when the alarm rings, it won't work at all if you require a louder alarm system. Since the app is limited to what Android delivers in terms of volume, it may not be sufficient in some cases. It is highly suggested to test the alarm while you are setting it up to make sure it works properly so that you won't run into issues in the morning when you need to turn off the alarm. Anyone who can wake up with only a normal alarm -clock style ringing wouldn’t like Alarmy. Don’t forget Puzzle Alarm Clock! The best alarm clock I’ve ever seen is mounted on two wheels. When it goes off, it leaps off the dresser and onto the floor, races around the room, under the bed, etc., and makes you catch it to turn it off. Truly inspired!